The Grey Ghost is billed as “A Fargo Adventure”, which means the heroes are Sam and Remi Fargo, an incredibly wealthy, globe-trotting couple whose hobby would appear to be treasure-hunting. There are many references to their previous adventures, so if you are a follower of the Fargo adventures, then you should be more than at home with The Grey Ghost. The action of the story takes place in the present, but the title of the story refers to a long-lost Rolls-Royce prototype, which was supposed to be launched in the early 1900s, along with the classic Rolls-Royce Silver Ghost. The prototype is stolen from its hiding-place, and doesn’t surface until many years later. Obviously, there is huge interest from automobile collectors in acquiring this “one-off” classic, which leads to all sorts of nefarious characters getting involved in the hunt for it. The story switches between present day and the early 1900s when the original theft took place. Clive Cussler fans will be happy to note the involvement of Isaac Bell, master detective in the early part of the proceedings. (There is a series of books by Clive Cussler and Justin Scott, entitled The Isaac Bell Adventures). As far the plot of The Grey Ghost is concerned, it involves the Payton family, who turn out to be distant relatives of the Fargos. Reginald Payton is the “hero” in the early part of the story, and he makes it his mission, along with Isaac Bell, to find the missing Rolls-Royce and clear his name. His cousin, Jonathon, the 5th Viscount Wellswick, would appear to be a prime suspect. There is also a “treasure” involved with the theft, something that the rogues in the tale would love to get their hands on, but until the Fargos turn their minds to it, it has been as elusive as “The Grey Ghost” itself. The story takes us around Europe with the high-flying Fargos, who are determined to clear the good name of their penniless cousins. 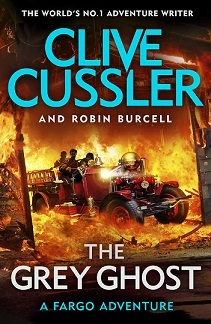 The Grey Ghost is easy reading, once you get into it and get the character list from the 1900s and present day into perspective. I must say that I wondered how much actual writing Clive Cussler (billed as the world’s number one adventure writer) does these days, as all of his current output is in conjunction with other authors.